Which toll-free service is right for my business? 1300 and 1800 numbers have become increasingly popular nationwide and are widely perceived as business numbers. Regardless of the size of the enterprise, these virtual numbers have augmented the brand of various organizations giving them a professional image that is deemed open and responsive to their customers. 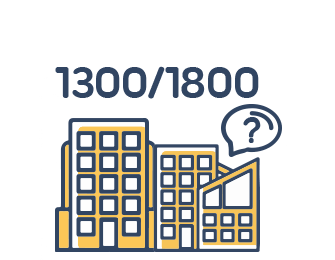 Due to their popularity and similarity, both numbers are often regarded as toll-free numbers but knowing the subtle differences between the 1300 and 1800 could offer significant benefits to you as a business owner or your customers. As a business owner, both 1800 and 1300 numbers allow you to keep in touch with your customers by making you easily accessible to your customers within Australia. For your customers, due to their relatively cheaper call rates, they can easily access you, regarding any issues or questions about your products and services. Since these virtual numbers are used by many large companies, smaller companies can leverage on that to give the impression that their business has a wider national reach. Both 1300 and 1800 numbers are independent of any physical location and do not contain any area codes. By using a 1300 and 1800 number, you free yourself from automatically being identified by your area code. This is highly beneficial since local phone numbers can be easily identified by their area codes and this can limit your reach to new businesses outside your region. Potential customers often prefer dealing with companies they feel are situated within their locality which gives them a sense that they can easily access support when needed. Both 1300 and 1800 numbers are identical to each other in terms of their features, functions and the way they are configured. Both 1300 and 1800 numbers are only inbound numbers which means they can only be used to receive incoming calls but not to make outgoing or external calls. Both are 10-digit virtual numbers that can be assigned to any phone system like your existing PSTN lines, Voice Over IP, mobile or even an Interactive Voice Menu. The numbers can be customized to spell out words that represent a business name or monikers that can be easily remembered by your customers which can be very useful in sales and convenient for your clients. Both numbers are nationwide numbers without any geographical limitations or markers. They are not restricted to any provider which means they are portable and belong to you till you decide to port it away to another provider. The only difference between 1300 and 1800 numbers is due to the way the calls are billed. Account holders are billed for all incoming calls to 1300 to 1800 numbers, however, call rates to 1300 are normally lower than their counterpart because the cost of the call is shared between the Caller and the Account holder. The type of device used to make the call or the origin of the call- such as mobile, landline or pay phone. The subscription or call plan you have chosen with your service provider. The origin is the most important factor. All call costs to both 1300 and 1800 depends on the origin of the caller and/or whether the call is made from a mobile or landline. Calls from any fixed line phone or land line to these virtual numbers are billed at a rate equivalent to local landline calls regardless of the callers’ location. As the account holder, you typically pay a monthly subscription fee and a share of the call depending on your call plan. Calls from Mobile phones are generally higher and depends on the rate charged by the service provider. Conversely, the call costs for 1800 numbers from land lines are borne solely by the Account holder. This means that caller is not charged for making a call to 1800 numbers and that is why they are also referred to as TOLL FREE numbers. With the latest regulation from ACMA, there are no more charges associated to calls to 1800 numbers from mobile lines, Hence the caller those not pay any charge and all charges are paid by the Account Holder. 1 Cost is shared between account holder and the caller. Caller pays same rate as if he/she calls local phone number. Also known as Toll Free Numbers, the account holder pays for all the cost of the call. 2 Enables the account holder to save cost on phone bills No savings on phone bills. 4 Cheaper for customers compared to mobile numbers or landline numbers from outside the local area, but could prevent contact from certain callers due to economic reasons. Free for all callers. No economic barrier to customer interaction. WHICH NUMBER IS RIGHT FOR ME? Finding the type of virtual number that is right for your business depends on the size of your business, volume of inbound calls expected and your revenue. Because the call rates of 1300 are shared between the account holder and the caller, these numbers are a perfect fit for small to medium sized enterprises that do not want to incur significant monthly telephone bills. However, since these numbers are not free to call, some customers may not call unless they are willing to incur the cost. On the other hand, 1800 numbers are free to call (Toll free numbers) which removes any financial barrier to customer interaction. The call rates are paid solely by the Account holder and is particularly suitable for big corporations, government organizations that are not on a budget. To help you decide which number that is suitable for you, VoIPLine Telecoms have an unlimited pool of 1300 and 1800 numbers on different call plans and at competitive rates which can increase your business reach. The Cloud Hosted PBX, presented on a web friendly graphic user interface empowers you to chose whether you want to connect your 1300 or 1800 number to a SIP Trunk, PSTN line or IVR by simply dragging and clicking your mouse.